Fuji Tappers feature an easy to use throttle and reversing trigger combined with a universal tapping chuck provide a smooth tapping operation. Fuji Tappers are available in tapping capacities from 6mm to 13mm. 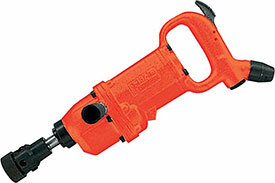 The 5412102787 Fuji NPT FT-13Z-1 N Tapper is one of thousands of quality tooling products available from MRO Tools. Please browse Fuji Tappers for tools similar to the 5412102787 Fuji NPT FT-13Z-1 N Tapper. 5412102787 Fuji NPT FT-13Z-1 N Tapper description summary: Model: FT-13Z-1 N Chuck: Drill Chucks (D) Steel Capacity: 13mm/ 1/2'' Aluminum Capacity: 8mm/ 5/16'' Free Speed: 400min-¹(R)/ 400min-¹(L) Spindle Type and Size: Jacobs Taper 6 Chuck Capacity: 13(M.T#) Overall Length: 384mm/ 15.1'' Weight: 4kg Quantity discounts may be available for the 5412102787 Fuji NPT FT-13Z-1 N Tapper. Please contact MRO Tools for details.